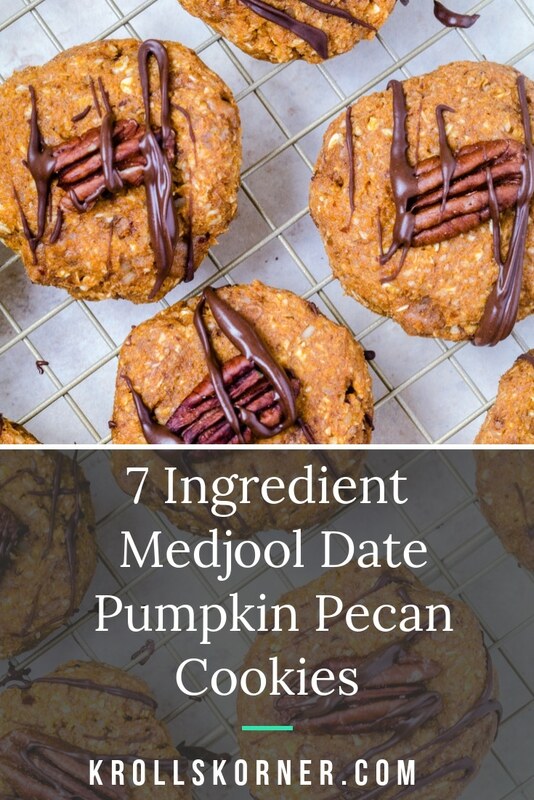 Drop what you’re doing and make these Medjool Date Pumpkin Pecan Cookies made with Natural Delights® Pecan Pumpkin Pie Spiced Date Rolls! Disclosure: I created this blog content in partnership with Natural Delights® Medjool Dates. I was compensated for my work, and all opinions are solely my own. Find additional information on these Pecan Pumpkin Pie Spiced Date Rolls! I am so obsessed with these Natural Delights® Pecan Pumpkin Pie Spiced Date Rolls because they are filled with the flavors of Fall. 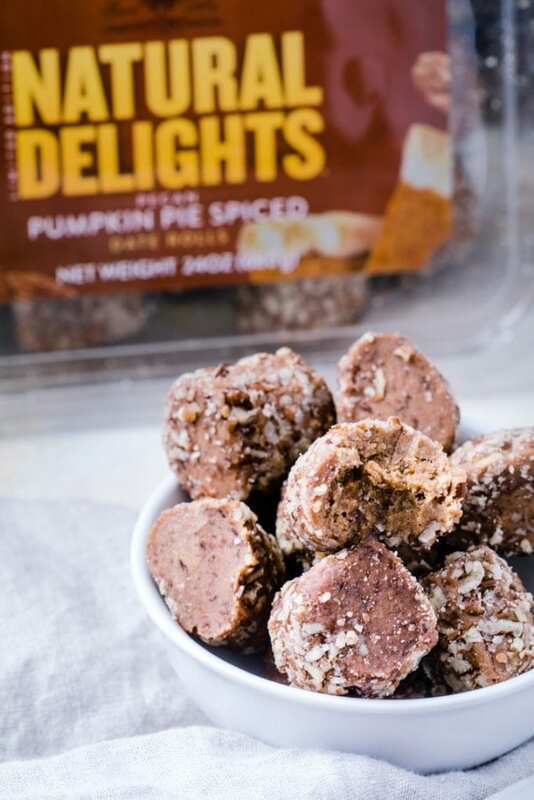 Each bite tastes just like pumpkin pie, but with simple, pure ingredients and no added sugar! (hollllaaaa!) They are a only available for a limited time, so RUN, don’t walk to grab your goods! My newest collaboration is with Natural Delights® and I am so excited to finally announce it! Over the next year I will be sharing a plethora of recipes featuring Natural Delights® Medjool Dates. Have you had them before?! If you haven’t, here are some things to note about them. Medjool dates are a fresh fruit, not dried. They are the largest and sweetest of the date varieties. Medjool dates are low on the glycemic index, have 33g of carbs per serving (which is 2 Medjool dates) and 281mg potassium! One of my other favorite no bake desserts are my Gluten-Free Date Brownies. Have you tried them out yet? I always use the pitted Medjool dates to make the process easier! Cookies often involve a stand mixer, a bunch of dry ingredients, mixing bowls, and the list goes on! 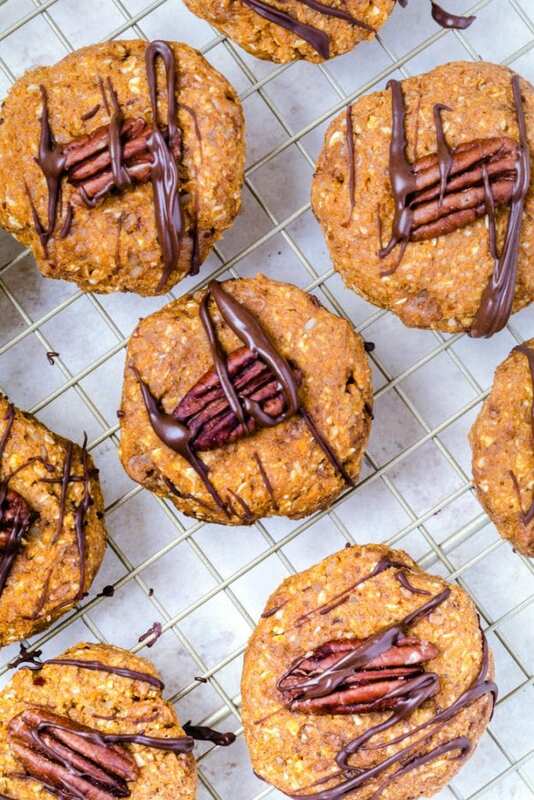 These cookies have minimal ingredients and are so simple to make! What do you need to make these cookies? YES. I highly recommend keeping them frozen actually and popping one out of the freezer when ready to eat! YES. Be sure you are purchasing gluten-free oats! 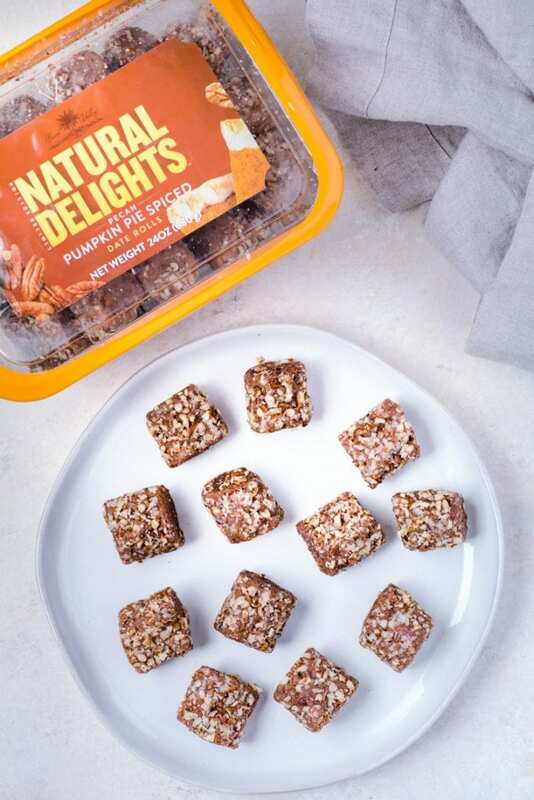 What are the ingredients in the Natural Delights® Pecan Pumpkin Pie Spiced Date Rolls? They have Medjool dates, pecans, and pumpkin pie spice (cinnamon, nutmeg, ginger, and Allspice). No sugar added! How long do these cookies take to make? 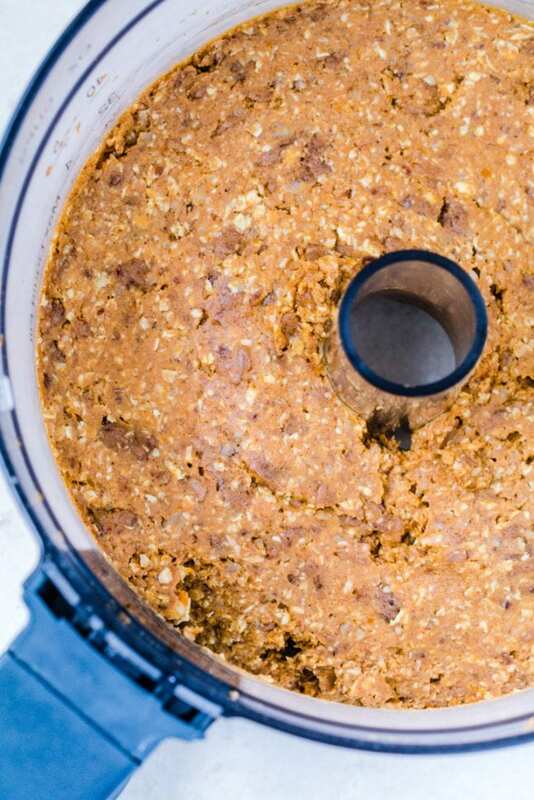 About 10 minutes to make in the food processor, and then 30-45 minutes in the freezer! Use a cookie or baking sheet lined with parchment paper to place cookies in the freezer. Once they are frozen you can place them on a wire rack to drizzle the chocolate mixture on top. If you like this cookie recipe, you should try out my chocolate chip cookie recipe! I use muesli to bulk them up and add fiber. I am all about enjoying healthful sweet treats! 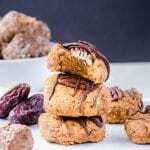 Or if you are not feeling like chocolate, these Peanut Butter Blueberry Cookies are like adult peanut butter and jelly cookies! 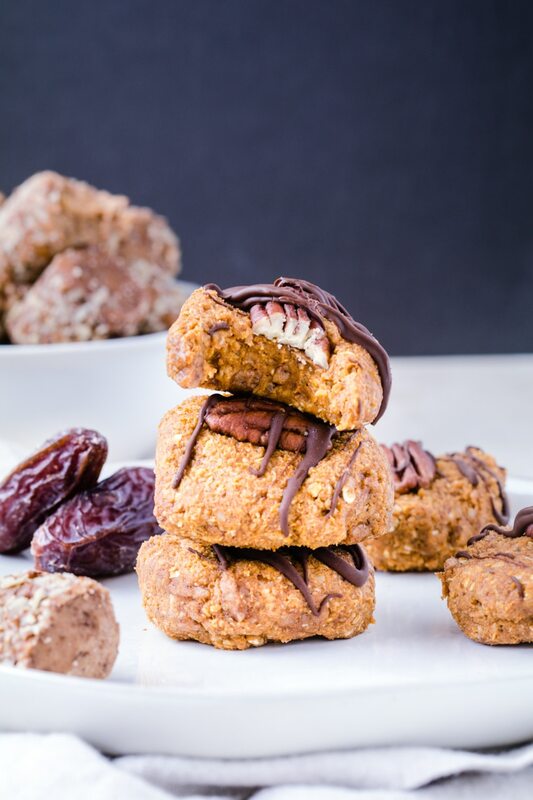 These no bake, minimal ingredient cookies are filled with pumpkin pie flavor and contain Natural Delights Pecan Pumpkin Spiced Date Rolls so they are healthy and delicious! In a food processor, mix all ingredients (besides chocolate chips and coconut oil) together until well blended. Be sure to chop them up a little so you are not left over with big chunks in your cookies! Line a baking sheet with parchment paper. Roll your cookies into balls (about 3 Tbsp. per cookie) and then flatten out a little and place on the parchment paper. This recipes makes 8-10 cookies. Place 1 pecan halve on each cookie. Freeze for 45 minutes. Then melt chocolate chips and coconut oil in microwave. Heat for 1 minute, stir, then heat for another minute. Drizzle and enjoy immediately! Freeze cookies in an airtight container. What is your favorite way to enjoy Natural Delights® Medjool dates?! 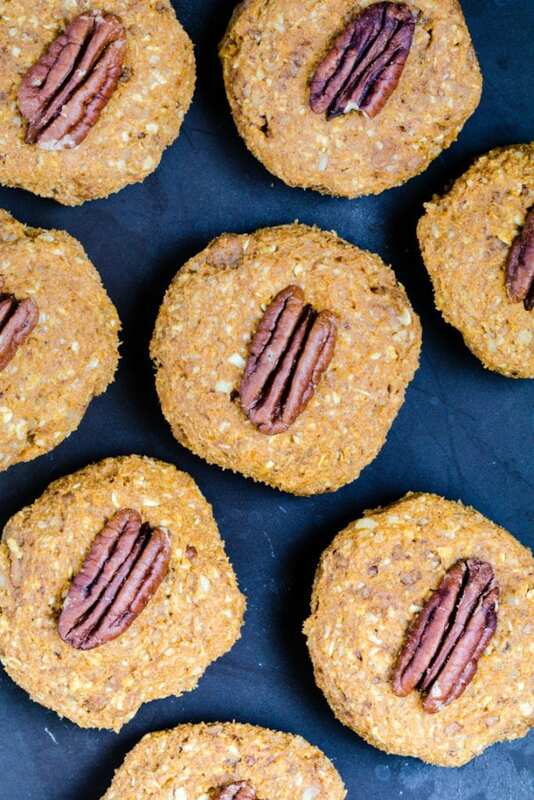 PIN THESE 7 INGREDIENT MEDJOOL DATES PECAN PUMPKIN COOKIES FOR LATER! Cookies in no time! Love it! SAME!! There is always that leftover pumpkin and you wonder what the heck you should do with it…wasting it is not an option! Medjool date cookies to the rescue 🙂 Thanks Kelli! I’ve been obsessed with dates since we had those bacon-wrapped dates in SLC! I have to try baking with them more often. These look sooo good- love that their only seven ingredients! Omgggg YES thank you for sharing those with me!!! And thank you – all about easy and healthy recipes and Medjool dates make treats so tasty! this recipe looks so good!!! I love using dates in cooking. I also love that you can freeze these and just pull one out when you want a little something sweet. Saving this one! Thank you Susie! Medjool dates are my go for something sweet when I don’t want added sugars! Freezer cookies would be perfect for a busy momma like you, enjoy!! Love medjool dates! I’m allergic to pecans so I had to sub almonds, but they’re so good!! That’s amazing!! So happy you had everything on hand and loved them! Medjool dates are a staple in my pantry! I love how I don’t have to turn on the oven- No bake for the win! Excellent idea! These turned out soooooo good!! I will be making them all fall long – thank you! Aw yay so glad you were able to try them out – especially since these Natural Delights Medjool Date rolls are only available for a limited time! Thank YOU! So I have made a million things with dates, but never thought to use the date rolls!!! These are amazing! Yessss thank you! Date rolls change lives! So yummy and healthy!